Welcome to the Red Star Express website. We're glad you stopped in to pay us a visit. Check around, we've got lots of goodies here for you. 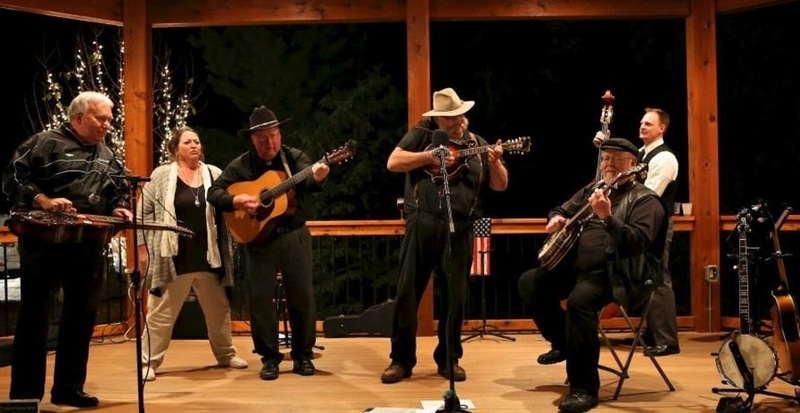 RSE is known throughout Eastern Wisconsin for its lively performances, fast paced bluegrass, and inspirational Gospel songs and great fun on the stage. 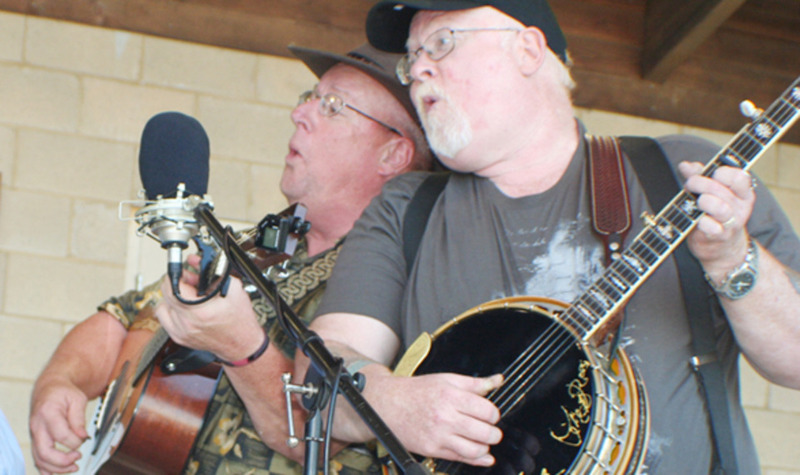 Tightly knit harmonies and precision bluegrass solos weave a style that is distinct to this band from Newton, WI. 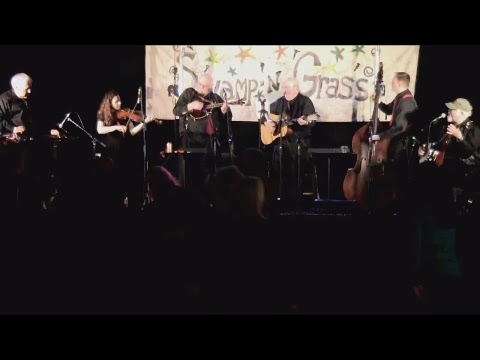 A few years back, we coined the phrase "Newtongrass" to explain our brand of bluegrass to our listening audiences. 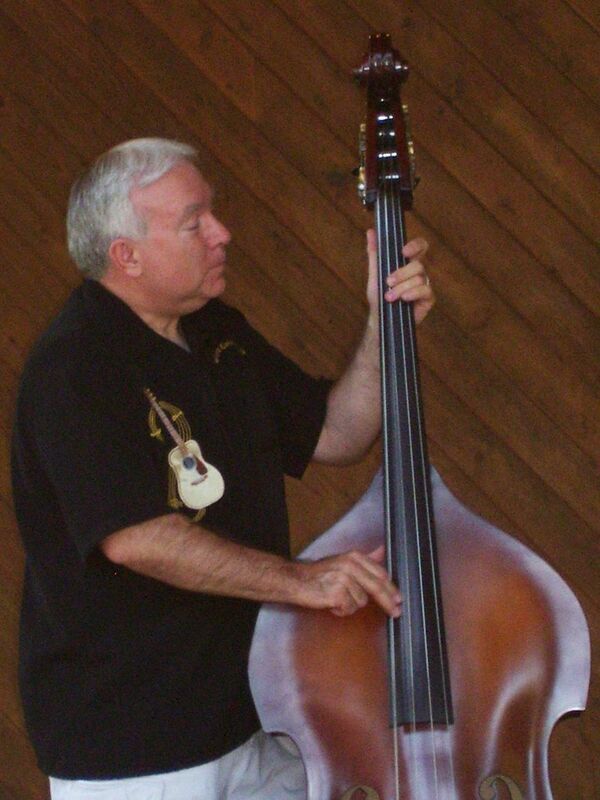 We honor the roots of American bluegrass music, learned from the likes of Bill Monroe, the Dillards, the Stanley Brothers and others like them. Being comprised of mostly Wisconsin natives, we realize that it's pretty hard for us to copy exactly this style of music that is so entrenched in the culture of the southern US. So, our bluegrass might sound a little different than the standards. That's why we like to say its bluegrass you might expect, but it's NewtonGrass you're gonna get! Be sure to check our calendar for upcoming performances. 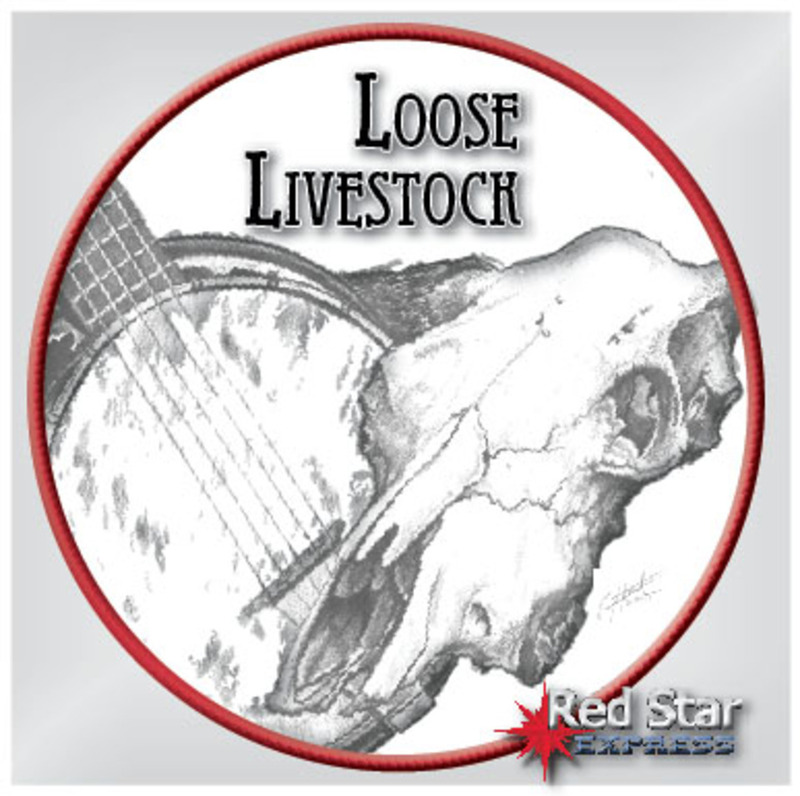 Red Star Express would be thrilled to consider playing for your event, or at your venue. Click on the contact information at the bottom of the page to connect with our scheduler. Our long awaited second Gospel Bluegrass CD is back from the pressers and ready for release. We will be playing two CD release shows, one at the Cup O Joy, Friday, February 15 and the other at our traditional Gospel bluegrass concert at St. Peter's UCC in Kiel, Saturday, March 16. The new CD, entitled "Redeemed," has 16 tracks, featuring five RSE originals. Stay tuned here for info on how to get your CD or digital recording. Details coming shortly. Second set of SwampNGrass kickoff night. Thanks to all the great fans who filled the dance floor. Gettin' pumped up for SwampNGrass! 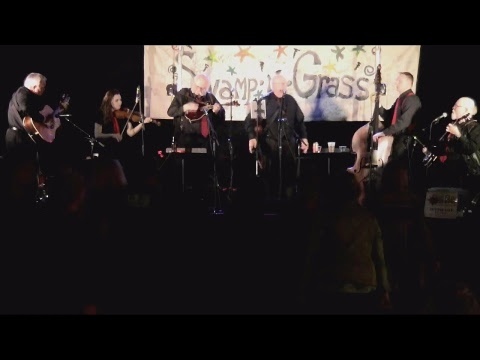 Wisconsin's finest indoor bluegrass and music festival is calling Red Star Express to handle the kickoff duties for its Silver Anniversary Festival on Thursday, Feb. 7 at 7 p.m.
RSE will play the opening set for the annual SwampNGrass festival held at the Shore Club in Elkhart Lake (formerly Victorian Village). 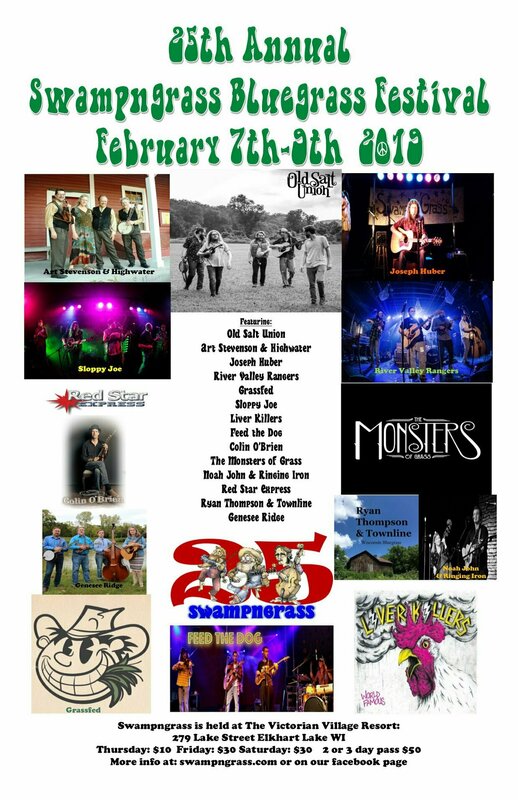 The festival runs from Thursday through Saturday evening, featuring many standout WI groups, including Art Stevenson and High Water, Sloppy Joe, Joseph Huber, Liver Killers, Noah John and Ringing Iron & more! Come on out to the former Vic Village and bring your dancing shoes This is going to be FUN TIME !! Red Star plays Thursday from 7-9:30, with fiddler Jenny Holmes joining the fray. Admission for Thursday is $10 and tickets can be purchased at the door. Music Thursday night, all day Friday. Tickets can be purchased at the door all weekend. Our bookings are handled by Mike Mathes. You can contact him at the following locations.